Happy Thursday Loves! So glad this week is winding down. I love finding simple dresses with hints of "cool". This Zara dress I picked up has those hints of sparkle. The beaded collar and studded buttons take a relatively "simple" dress and pump it up. Add a denim jacket and some gold sequin booties and you're set for a fun day out! You are stunning - I love your hair! You are so beautiful.I love your outfit as well as your smile. Keep smiling!! Love the dress! Looks so cute with boots and the jacket. want to follow each other?? Love this look! The dress is so cute with the booties! that dress and the color of it is beautiful! i love it so much!! love the dress and your cuteness!! 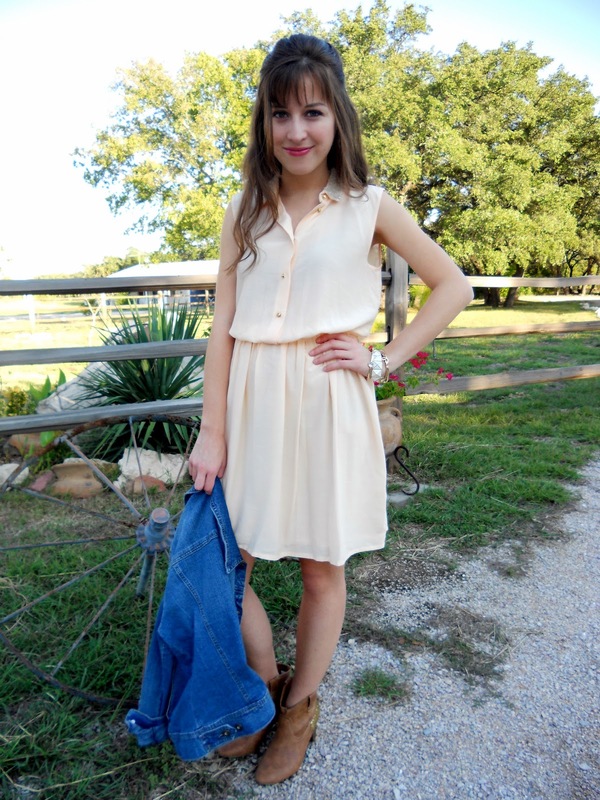 Cute dress and awesome boots! Such a pretty dress! I love when pieces have little details--I often buy things solely for that reason! Love you hair in this too, by the way! You look gorgeous in your dress! 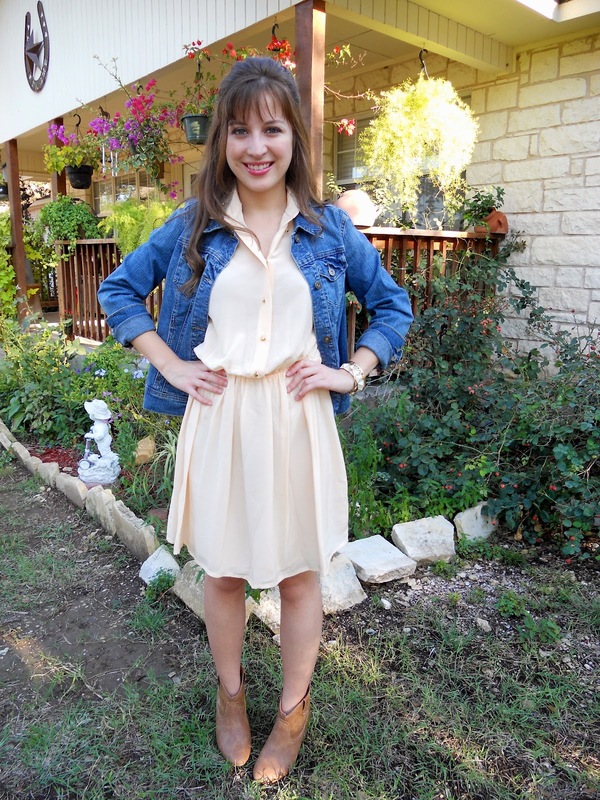 I love the way you paired it with your denim jacket and boots! lovely! LOVE this combo of the rough and feminine. AND your hair looks fab! Oh, I heart this outfit & those boots!!! Those boots are awesome, and you're right about the pretty details on that dress! This is such a gorgeous look, perfect for the transition between the seasons! gorgeous especially paired with the jean jacket. I love so so much this drees! You look so pretty with it! Great simple dress...i liked how you paired it with the denim jacket. Cute boots with that dress! I love weather when you can wear dresses with boots and bare legs. Lovely outfit! The dress is great. Charming outfit dear, it looks so chic, I like the cute boots! Happy Friday! That dress is beautiful & your bangles are great too!! oh, and your hair...and shoes. I'm totally following your blog. Thanks for your sweet comment! I'm gonna have to become a follower... your outfits are so awesome! your dress is simply adorable! Such a romantic look! Love the dress! lovely ! follow you ! It's a gorgeous colour on you! Love the fringe too! That dress is SO pretty, and I love it with the ankle boots! Love the beaded collar! Adorable outfit! I am obsessed with this dress! Totally cool girl chic when paired with those fabulous booties! 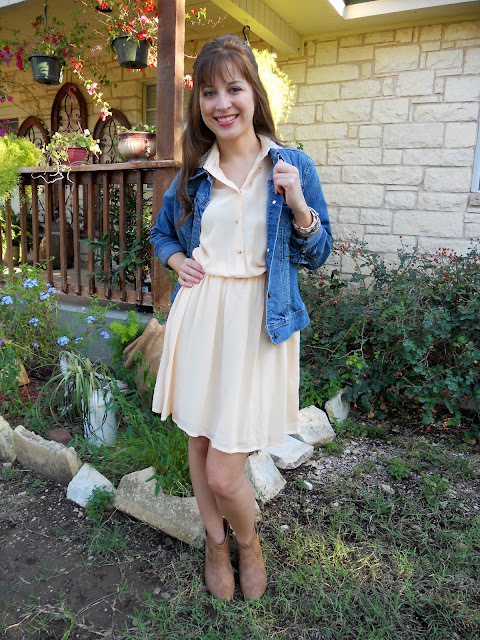 I love to wear my jean jacket in a similar manner - I think they look best with sundresses, and can be kind of awkward with other outfits!